Texas Tech University (TTU) required a comprehensive analysis and space use assessment of the existing university library with a goal to meet shifting user needs over the next twenty years. The existing 365,000 GSF building consists of an original 1960 building and a 1976 addition, housing the library’s 1.9 million volume collection. The Space Assessment began with an analysis of existing conditions, including program, seat counts, collections, computer usage, and a dedicated observation period of peak usage during Finals. A series of focus groups were conducted with undergraduate and graduate students, faculty, staff, and librarians. Through this process, the design team was able to document inefficiencies and formulate options for improving the library. During a fully interactive charrette, the steering committee and design team developed a preferred option, which identifies scope and costs for smaller, phased projects to be completed as funding becomes available. 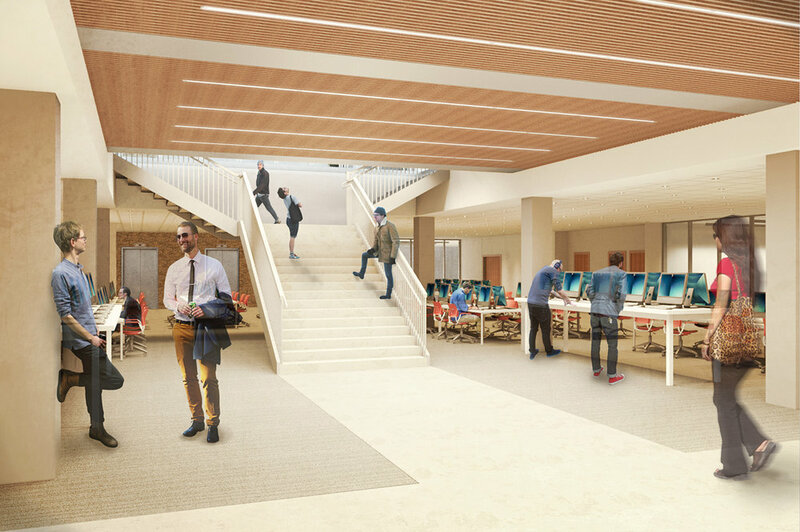 The proposed modifications to the library will improve wayfinding, service points, building connectivity, student learning spaces, furniture, and lighting. 60% of the collection will be transferred to a dedicated off-site storage facility, opening up space in the library for student learning and access to technology. A proposed addition to the building will transform the library into a campus hub, with a 300-seat auditorium, event spaces, campus board rooms, and emerging technology classrooms.